← Is Slavery Intrinsically Evil? Since the completion of my translation of the Bible in March of 2009, I’ve read a number of different comments about my work. More than a few persons have shown appreciation for my translation, the Catholic Public Domain Version. More than a few use the CPDV for private study and devotion. But some other persons have complained bitterly about my work, mainly on the basis that the translation is unapproved. The Catholic Public Domain Version (CPDV) is a translation of the Pope Sixtus V and Pope Clement VIII Latin Bible, called the Vulgate. I translated the entire Bible from Latin into English, using the Challoner revision of the Douay Rheims Bible as a guide. I worked nearly every day for just over 5 years, translating and editing, in order to produce this work. The CPDV is a fairly literal translation of the Latin Vulgate Bible. It is much more literal than most modern translations, and about as literal, maybe a little less so, than the Challoner edition. The Catholic Public Domain Version does not impose inclusive language on the text of the Bible. Some words or phrases in the Latin text (or any text) are ‘inclusive’ in the sense that no gender is expressed. However, the term ‘inclusive language’ generally indicates an alteration of the text, deleting or obscuring make references (but not female references). The CPDV rejects this increasingly common approach to Bible translation. The CPDV retains the male pronoun for God and for each Person of the Trinity. Also, expressions such as ‘the sons of Israel’ in the OT and ‘brothers’ in the NT are translated accurately, retaining in the male form of the word. * the OT was translated in the light of the NT, while both Testaments were translated in the light of Roman Catholic teaching. The CPDV has not been approved by any Bishops’ Conference or by the Holy See. However, neither has the translation been condemned or rebuked by the Church. To date, no Bishop or Bishops’ Conference has rendered any negative judgment, nor has the Holy See. The most common complaint is that the CPDV is not approved by the Church. Formerly, a Bible translation could be published with the approval of a Bishop (the local ordinary). At present, the Canon in question requires the approval of the Holy See or the local Bishops’ Conference; annotations are also required. I’ve chosen to publish my translation without ecclesiastical approval for a number of reasons, stated below in no particular order. 2. In theory, the requirement of approval is supposed to prevent poor translations from being published. But in fact, some of the worst translations in the world (literally, with no exaggeration) are approved, including inclusive language editions, loose translations, and thoroughly Protestant translations, with few alterations so as to label them Catholic. Protestantism is material heresy. And yet translations of the Bible by a group of Protestants (e.g. The Good News Bible, a.k.a. Today’s English Version) who reject the authority of the Pope and the Bishops, who reject very many infallible teachings of the Magisterium are accepted. The idea of requiring approval from a Bishops’ Conference or the Holy See has failed to protect the faithful from bad translations. A better approach would be to permit any Bishop to approve of a translation, or to permit translations to be published without approval, and then have the Bishops, Bishops’ Conferences, and the Holy See teach on the meaning of Scripture and on its proper interpretation. 3. The Holy See already has teaching documents on Bible translation, such as Liturgiam Authenticam and the Norms for Bible Translation. But they are ignored and contradicted by Biblical scholars, and the resulting translations have received approval. The USCCB and its committee on Bible translations prefers loose translations and inclusive language translations, in contradiction to the norms for Bible translations written by then-Cardinal Ratzinger, who is now Pope Benedict XVI. When the editors of the RSV second Catholic edition were working on their translation, the USCCB committee refused to review it. The Holy See (via the CDW) gave approval to the RSV2, and so the committee finally did give their approval, but only pro forma, without review of the text. And the USCCB continues to refuse to include the RSV2 on their list of approved translations. They list the loosely-translated, inclusive language New Revised Standard Version, Catholic Edition as approved, but not the RSV2. I cannot even find a single reference to the RSV2 on the entire USCCB website (even though they approved of the translation). 4. The USCCB has chosen to use their control over the New American Bible (in its various editions) to oppose the will of Pope John Paul II and Pope Benedict XVI on Bible translations. Pope John Paul II found the New American Bible unfit for use in the Mass, due to inclusive language and loose translation, and so it had to be altered for the liturgical texts. But the USCCB refused to allow anyone, even themselves, to publish that improved version used in the Mass, except in liturgical books. The version that was found unacceptable by the Pope was kept in publication in print and on the USCCB website, until the new version of the NAB, often termed ‘NABRE’ for New American Bible Revised Edition, was released. With this new version, this approved translation has become worse. The USCCB could have incorporated the norms written by Pope Benedict XVI (as Cardinal Ratzinger), especially on the point of avoiding inclusive language. Instead, with the NABRE, the U.S. Bishops have chosen to reject those norms, and to use inclusive language more extensively than ever before. 5. The faithful need the Word of God more than they need food or water. “Man shall not live by bread alone, but by every word of God.” (Lk 4:4). But most modern translations have grave problems. In the current time, most English translations of the Bible are loosely translated, obscuring and distorting the true meaning of the Word. Most translations are plagued with inclusive language, which obscures and subverts the will of God that men and women have different roles in the Church, the family, and society. In addition, most translations are plagued with annotations (footnotes, commentary, introductory text, etc.) that contradict and undermine the true teachings of Tradition, Scripture, Magisterium. Very much harm to souls is being done by the annotations to various editions of the Bible. Yet annotations are required by Canon law. The excellent Douay translation has not been updated in many years, and so has the difficulty of archaic language. The RSV (especially the first edition) suffers from the influence of Protestant translators. Many other translations are loosely translated, and take appalling liberties with the text. Alarmingly, most modern translations have chosen to omit words, phrases, and entire verses from the Bible, according to their own scholarly judgment. Worse still, many of these omissions are based on the work of Protestant Biblical scholars, who have no regard for the teaching of the Magisterium on any subject. But the dogma on Sacred Scripture taught by the Council of Trent is that the Canon includes all those books — with all their parts — as found in the old Latin Vulgate (meaning the Latin Scriptural tradition). Also, ever since Divino Afflante Spiritu was published by Pope Pius XII, scholars have almost entirely abandoned the Latin Scriptural tradition, so highly prized by the Council of Trent and by the Church as a whole for many centuries. I don’t believe that Pope Pius XII, in approving the use of Hebrew and Greek and Aramaic manuscripts for Bible translations, intended or anticipated this utter rejection the Latin. Most modern Biblical scholars take the point of view that the OT should be translated with no regard for the NT, and that both Testaments should be translated with no regard for the doctrines of the Magisterium. This approach is essentially the separation of faith and scholarship. The effect of this view is seen in many modern Bible translations, which treat the Sacred Text as if it were a merely human work, subject to error, subject to unlimited manipulation, criticism, and alteration by scholars. And yet despite all of the above described grave problems, the resulting translations are approved. The requirement of approval has utterly failed to protect the faithful from poor Bible translations. In many cases, it does the opposite, promoting bad translations, which the faithful assume are good because they are approved. 6. 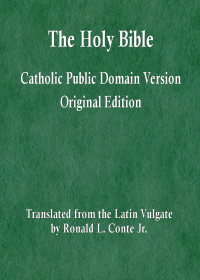 As a result of the above considerations, the faithful have long been in need of a literal translation of the Bible, based on the Latin, avoiding inclusive language, following the Vatican norms, and translated with faith, so that the OT is translated in the light of the NT, and both Testaments in the light of Roman Catholic teaching. The need of the faithful for this type of Bible translation supersedes Canon Law. Whoever says otherwise has fallen into the error of Pharisaism. Whoever says otherwise prefers following rules over avoiding grave harm to souls. 7. I understand that the eternal moral law taught by the Church takes precedence over the rules and regulations of the Church. Violating a provision of Canon law is not necessarily immoral. The Magisterium teaches that any act is morally permissible if it has three good fonts of morality: 1) only good in the intention, 2) only good in the moral object, 3) the reasonably anticipated good consequences equal or outweigh the reasonably anticipated bad consequences. My good intention is to make the Sacred Scriptures clearer and more accessible to the faithful by offering a conservative literal translation of the Latin Vulgate. My intention is to counter the many errors of modern translations with a faithful Catholic translation. It is not intrinsically evil to translated, edit, or publish the Bible. The good consequences of publishing a new translation of the Bible, one faithful to Vatican norms for Bible translation, one free from the distortions of the holy Word of God caused by loose translations and inclusive language, one that is faithful to Roman Catholic teaching, are innumerable. The bad consequences of violating that Canon are limited. So the act is morally licit; it is not a sin. 8. I understand through prayer, grace, and providence, that it was the will of God for me to translate, edit, and publish this version of the Bible. I believe it is contrary to the will of God for me to seek the approval of the USCCB or the Holy See. Related: When is it moral to break Canon Law? This post has become longer than I had intended, so I will leave further explanations for a later post (hopefully). The restriction of Bible publication to approved editions has done much harm to the faithful, and little or no good. Therefore, I will not comply with that restriction, even if my translation were certain to be approved. Gallery | This entry was posted in Canon Law, Scripture. Bookmark the permalink. I have noticed that the New American Bible is not always consistent with other English-language translations of the Bible. For example, 1 Thessalonians 4:4 in the New American Bible says the following: “that each of you know how to acquire a wife for himself in holiness and honor”, whereas the same verse in the CPDV says the following: “that each one of you should know how to possess his vessel in sanctification and honor.” 1 Thessalonians 4:4, as it appears in the NAB, actually has a different meaning from the CPDV translation of the same verse. The NAB version of this verse tells married men to treat their wives with respect and to abstain from adultery and sexual sins within marriage, whereas the CPDV version of this verse tells all people to refrain from all dishonorable uses of the sexual faculty. Is the NAB version of this verse mistranslated? Will there be a replacement for the New American Bible in the U.S. Catholic Church that corrects translation errors found in the New American Bible? Yes, that is a severe translation error in the NABRE. The Greek text says skeuos, which means instrument or vessel. The Latin text says vas meaning vessel. To translate the word instrument or vessel as ‘wife’ is absurd; it is a complete rejection of the actual text, not even a loose translation. Your expectation that this type of error will be corrected is overly optimistic. There are very many serious errors in most modern Bible translations, especially the looser translations like the NABRE and the NRSV and the NJB. The U.S. Bishops have not shown a willingness to choose strict translations of the actual text, instead preferring loose translations, inclusive language, and the type of deliberate change in the text itself that you pointed out. 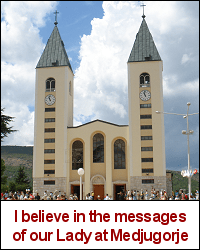 The Church is only infallible in its magisterial dogmatic teachings (and dogmatic facts). Decisions on the approval of Bible translations is a fallible act of the temporal authority, not an act of the teaching authority (the Magisterium).